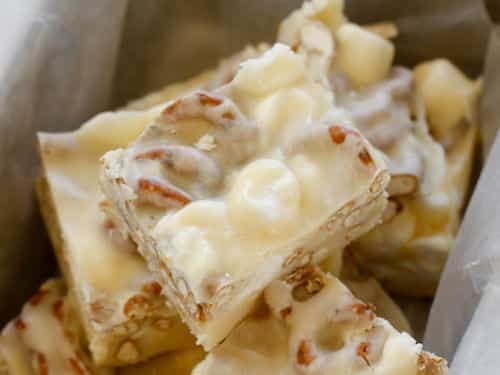 Chocolate Covered Pretzel Fudge is a creamy white chocolate fudge filled with salty pretzels and gooey marshmallows. If you’ve ever found yourself going back for just one more (and one more and just one more) chocolate covered pretzel from the bag in the cupboard, this fudge is going to rock your holiday gift baskets. This fudge tastes as if my favorite chocolate covered pretzels have met their absolutely perfect match in a marshmallow filled fudge. This fudge is so irresistible to me that I sent it off to the office with my husband almost as soon as I had it sliced. I’m typically not a big fan of white chocolate, but this? I could snack on this salty-sweet treat all day long. 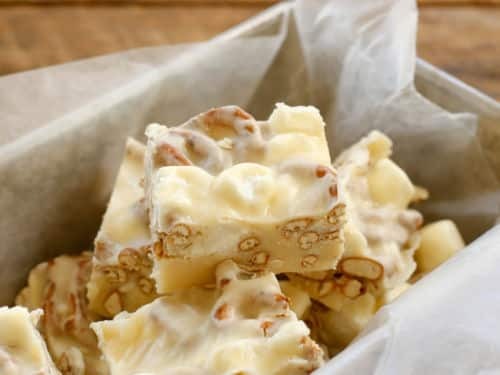 If you don’t happen to be a fan of white chocolate, this fudge works beautifully (and is equally tasty) when made with semi-sweet or dark chocolate. 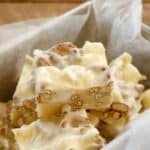 For more quick and easy fudge recipes, try this classic Chocolate Pecan Fudge, Buckeye Fudge, or White Chocolate Caramel Fudge. Some of the new ones on my list to try are Salted Caramel Mocha Fudge, Easy Gingerbread Fudge, and Hot Chocolate Fudge. I don’t think I could ever have too many great fudge recipes for the holidays. Stir until mostly smooth with just a few flecks of unmelted chocolate. Add the extract, pretzels, and marshmallows to the bowl. Stir to combine. Scoop into a parchment lined loaf pan. Spread with a spatula. Chill until ready to serve. Slice into 1-inch squares and store in an airtight container in the refrigerator. Enjoy! 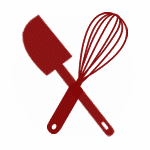 .your recipes look so delicious, and I would love to receive them !! I’m not a fan of white chocolate but when I read that you could use semi-sweet or dark chocolate I was sold! Yikes this looks good, pinning and sharing! I made this fudge the day you posted it, just in time for Halloween. It was so good, and really easy. I think next time I will break up the pretzels a bit before I add them, and I think I will add just a few more pretzels. But it was really good, thank you! There is no charge to use these recipes. Enjoy!